The alarm rang at 5am. My wife shot me a disapproving look out of the corner of one sleepy eye as I snuck out into the living room. I could hear the telltale sounds of heavy rain outside (to my unromantic imagination, it sounded a lot like like static on a television set). Not good. I love the monsoon, don’t get me wrong. I was heading to a forest, and there is scarcely a time of the year when it is more beautiful. But heavy rain would make my date – with one of the most beautiful guests Mumbai has the pleasure to host – a tad difficult. Nosherwan Sethna, a fellow traveller for this visit, would be connecting with this old flame after ages, and Yogesh Patel, who was also accompanying us, was yearning to frame this beauty in his camera. Before the three of us begin to sound like a set of Casanovas, I suppose I should clarify. Our respective wives and girlfriends had nothing to worry about. Today, we had eyes only for a certain flamboyant species of feathered biped, one that visits what remains of Mumbai’s forested wilderness with the advent of the southwest monsoon. 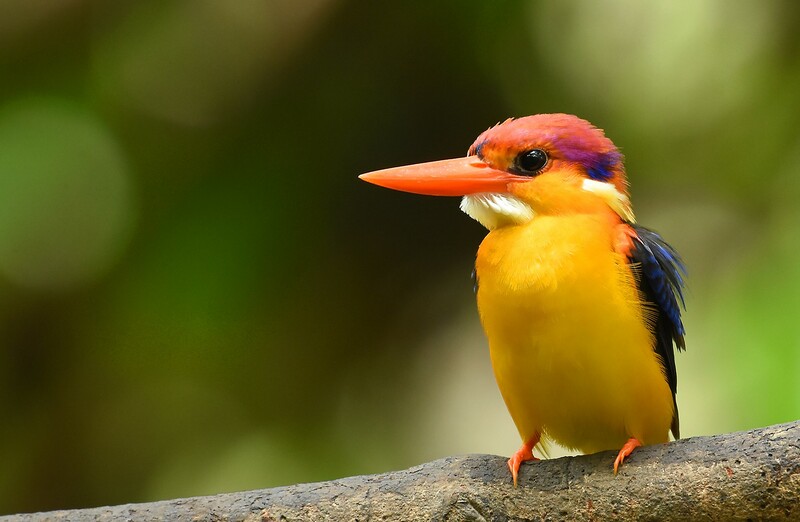 I am, of course, referring to what many birders in these parts know as ‘the jewel of the monsoon’, the brightly hued Oriental Dwarf Kingfisher, also known as the Three-toed Kingfisher. A fairly widespread species, it ranges from Sri Lanka, the Western Ghats and the Northeastern region of India to much of Southeast Asia, though I’ve read that its numbers are declining due to habitat destruction. The subspecies we see here, Ceyx erithaca erithaca, commonly known as the Black-backed Kingfisher, is a diminutive bird that keeps largely to well-wooded areas, migrating from the verdant hills of Sri Lanka and south India to breed here, constructing its nest hollows in the mud banks of forest streams and rivers. The three of us had seen this bird before, but mostly only as a bolt of colour as it zipped by in the canopy or across streams in search of its next meal. So when Raju Kasambe of the Bombay Natural History Society (BNHS), head of the Conservation Education Centre (CEC) located within the Sanjay Gandhi National Park, posted images of this beauty and invited visitors for a glimpse, the opportunity was too good to pass up. Fortunately, by the time we made our way to CEC, the rains abated. At the gate, two more birders who had come in the hope of seeing this winged beauty joined us. I noticed that many of the recent entries in the visitors’ register had noted ‘ODKF’, the acronym most birders use for this species, for the purpose of their visit. One might have thought we would be making our way to a densely forested area, but the security guard led us downstairs inside the centre building, straight to the kitchen! No, breakfast wasn’t on the agenda. All of the wonderful visuals captured of the ODKF over the last few days had been taken from the windows of the CEC kitchen, which overlooks a waterhole. It turns out, this waterhole was often frequented by the ODKF, for a quick bath or hunt for one of the several small invertebrates that inhabited the waterhole and its surrounds. Our vigil began close to 7am. I was perched on the kitchen counter – a coveted window seat, given the recent sightings. But luckily, it was just the five of us on that Tuesday morning. While I waited, Nosherwan and Yogesh decided to go on a quick stroll outside to check for other birdlife. The two other birders stayed put with me, keeping their eyes peeled to the other window. Some of my friends who had visited earlier had to wait only 20 minutes for their first sight of the bird; others had kept watch for 4 hours. I was hoping to get a glimpse in the next few hours – after all, most of us were due to get back to our respective offices at some point. The good part was that no one had gone back disappointed yet, with 2 breeding pairs recorded by the BNHS personnel in the vicinity. For about 40 minutes, all was quiet. And then, among the shadowed lianas surrounding the waterhole, a flash of gold. It looked like our object of attraction might have made an appearance. From the viewfinder of my camera, there was no mistaking those bright colours, even though the bird sat in the dark shadows of the trees on this overcast morning. The light was poor, and photography was not easy. The kingfisher soon issued a single high-pitched whistle and took off, vanishing into the wilderness. Although we were satisfied with the sighting, those of us who had brought our cameras were hoping that the light conditions would improve when the sun came out. However, the ODKF didn’t seem to be concerned about the light conditions. About 25 minutes later, it was back again. This time, I noticed something dark at the tip of the bill. My initial thought was that it had caught something, but on closer inspection, I saw that its bill was caked with mud, which it proceeded to clean off on the bark of the liana it was perched upon. Soon enough, the bird vanished from sight again. Still hopeful for a trickle of sunlight, we decided to wait. An hour passed with no sign of activity. Then, we spied movement at the corner of the clearing, but on the ground. We had a surprise guest – an Emerald Dove! 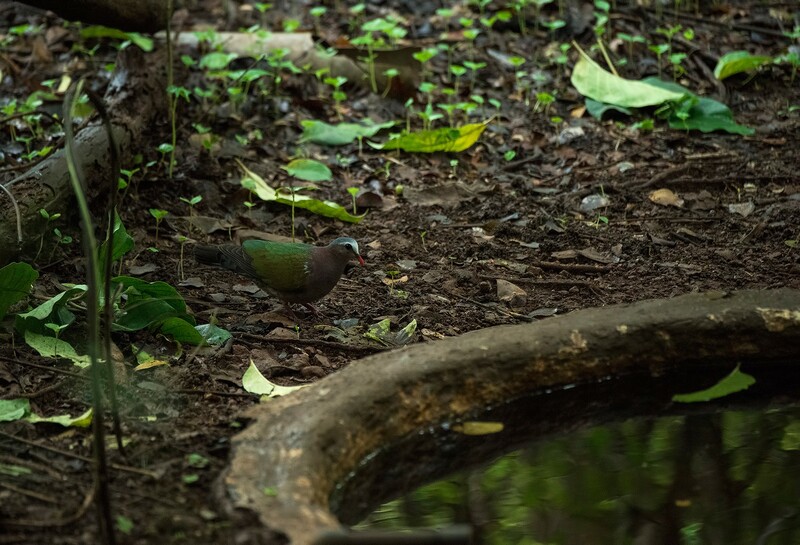 This beautiful bird was not a common sight in Mumbai, so we were delighted as it ventured closer and closer, foraging along the forest floor, giving us a chance to capture another shy forest denizen. After a short while, the dove flew off into the forest. And almost as soon as it left, the bird we had been waiting for returned, ready to give us paparazzi one last look. This time, with the light marginally better, we had a chance to capture a few more moods of this jewel of the jungle. Fate had at least one more surprise planned for us that day. Just as we were ready to leave, we spotted movement in the dense thicket. 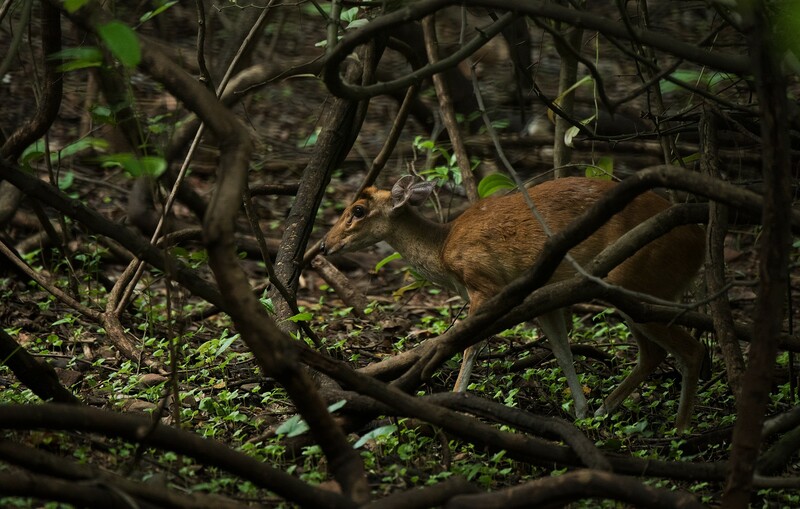 Out stepped another shy inhabitant of Mumbai’s forests, a female Indian Muntjac or Barking Deer, walking cautiously, feeding on the fresh green shoots of the forest floor. 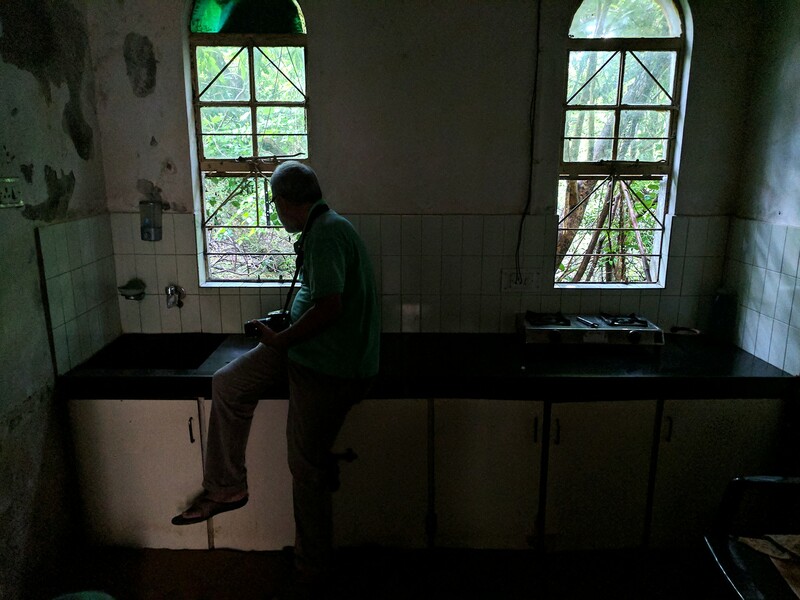 I would never have dreamed of such a sighting, sitting indoors in the city of Mumbai, but here I was, spying through the window of this humble kitchen, a portal to an almost mythical garden of Eden, where wildlife moved without fear. Even with modern conveniences an arm’s length away, I could, for those brief moments, feel the serene touch of being one with nature. 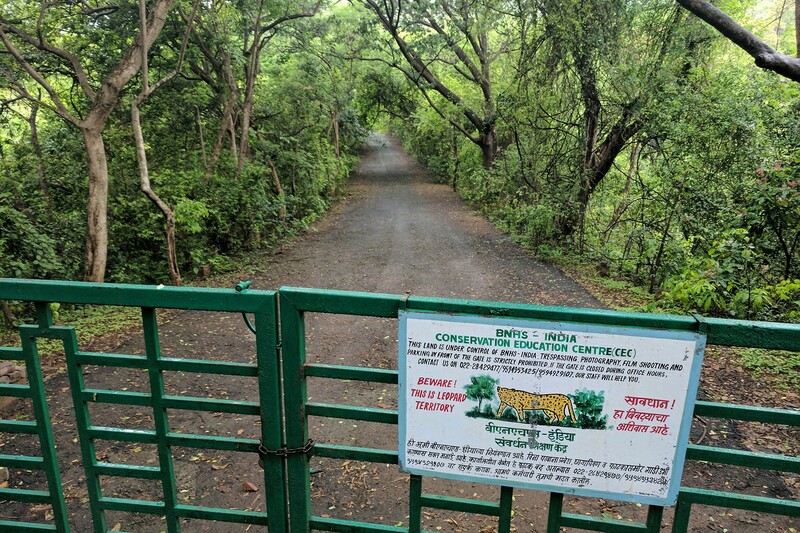 The Conservation Education Centre managed by the Bombay Natural History Society (BNHS) is located in Film City, Goregaon, within the Sanjay Gandhi National Park in Mumbai. BNHS members have free entry to the centre and its surrounding nature trails. Non-members have to pay an entry fee of ₹150. The timings are from 7.30am-5.30pm. For more details call +912228429477 or +919594929107.